Congratulations to Penny Vaughn who has been chosen as the client feature for April, 2016. Here what Penny has to say about her experience at SMARTCore Method . . .
“Life changing” is the way I would describe my experiences with pilates and the SMARTCore method! I began taking classes with Kaylee ten years ago after retiring from a career in nursing. I was curious about the Pilates Method, and how it might be able to help me be mobile, well balanced, strong, and generally to feel good. My joints, muscles, and posture had taken many hits over the years of being on my feet at work and exercising in ways that were not good for my body. My friend, Evelyn, and I began this journey and totally credit Kaylee and Jana for our being able to be flexible, active, and aging well! The integrative method of SMARTCore Method has corrected alignment problems, and strengthened my core. Kaylee and Jana take a very individual approach to each session by identifying areas of problems which are corrected or relieved by targeting the session to what I need that day. 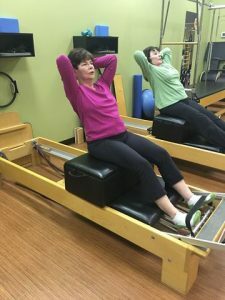 I always leave my session feeling renewed, strong, aligned, and as I often say to Kaylee or Jana, “my body feels free!” The SMARTCore Method has given me good habits to establish in the way I sit in my car, get up and down, and to stay pain free and mobile. I am grateful for Kaylee, Jana, and the SMARTCore method.